Hi Mandy just to let you know i HAVE A JOB!!!! YAHOOOOO i start next week in Matalan clothes shop. I can not tell you how GOOD THIS FEELS!!!!! its like i won the lottery lol. i am sending you these pics i took yesterday & as you can see from them there is a hell of a difference in just 2 weeks exactly from having the op don’t you think? i would like you to keep the pics in my file what you have of me & show other women what i have gone through in the hope TR can do the same for them. I will keep you posted with pics as i feel it very important to show others. 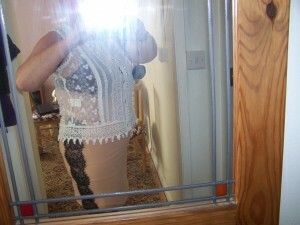 This bloating was very bad for me as i was having it at least 4 times a week! It was very hard & sore & 9 times out of 10 i could not get dressed as my clothes just would not fit me. Hence i could NOT GO OUT THE DOOR WHEN LIKE THIS! This is NOT how us women want to look is it? since i have had TR i have had NO BLOATING WHAT SO EVER! can not believe what the doctors have put me through. I mean i had the clips removed 2 years ago & that sorted the sharp pains i was having 20-30 times a day. But i feel i was made to suffer another 2 years to get the TR. Thank god for Mr Pickles!!!! he is a god send! i feel very strongly that i want to help others aim towards the TR.